Signed l.r., "H. Allingham". Not dated. Victorian watercolours: selections from the Art Gallery of New South Wales , Sydney, 2000, p 10, no 1. Victorian watercolours from the Art Gallery of New South Wales , Sydney, 2017, pp 24, 26, col illus p 26. Triumvir, Sydney Morning Herald, no 16108 , 'Art, music and the drama', 09 Nov 1889, p 7. National Art Gallery of New South Wales illustrated catalogue , Sydney, 1925, p 97, no 116. Revised edition 1926. National Art Gallery of NSW illustrated catalogue , Sydney, 1924, p 97, no 125. National Art Gallery of NSW illustrated catalogue , Sydney, 1921, p 79, no 125. National Art Gallery of NSW illustrated catalogue , Sydney, 1906, p 95, no 156. Revised editions 1908, 1910, 1912. Catalogue of the National Art Gallery of New South Wales (with illustrations) drawn by E L Montefiore, director, and others, published by sanction of the Trustees , Sydney, 1893, p 98, no 294. National Art Gallery of NSW illustrated catalogue , Sydney, 1917, p 85, no 145. Revised editions 1918, 1919. Catalogue of the National Art Gallery of New South Wales, (with illustrations), drawn by E L Montefiore, Esq (President of Trustees) and others, published by sanction of the Trustees , Sydney, 1891, p 88, no 349. The magazine of art , 'Art in June - Exhibitions of the month', London, Jun 1889, pp xxxiv–xxxv: p xxxiv. 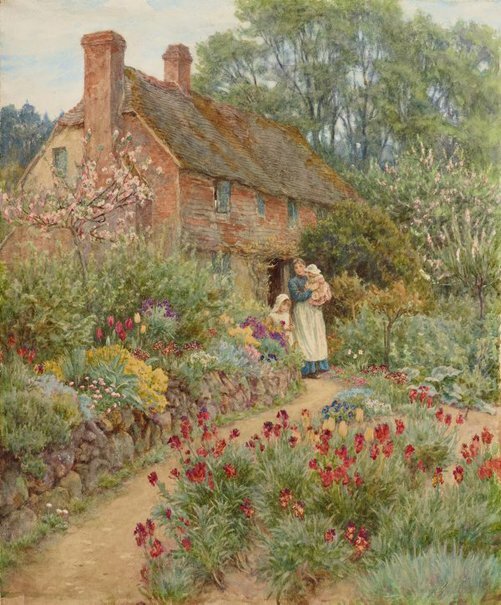 Water-colour drawings by Mrs. Allingham entitled "On the Surrey border" , London, 1889, no 17. Catalogue of the National Art Gallery of New South Wales, published by the Trustees , Sydney, 1899, p 54, no 321. The exhibited works of Helen Allingham RWS, 1848–1926 , Wallingford, 1979, p 11. Hand and eye - a survey of artists materials and techniques: Art Gallery of New South Wales Travelling Art Exhibition 1970 , Sydney, 1969, p , no 56, illus p .
National Art Gallery of New South Wales illustrated catalogue , Sydney, 1928, p 118, no 171.